The Soft Red Winter Wheat and the Spring Oat regional trials are generally grown in four locations while the Spring Barley regional's are grown in three locations. The wheat and oat trials near Ithaca consist of 2 replicates while those out in the state consisted of 3 replicates. All spring barley trials have 3 replicates. All trial plots are 6 row plots 4 meters long with 18 cm between rows. Prior to harvest, the plots are trimmed to 3 meters and harvested with a plot combine. Disease and lodging notes were recorded on a 0 to 9 scale with 0 being the best and 9 the poorest. All trials are planted in a randomized complete block design and analyzed by standard ANOVA. If there are indications of within replicate field variation a second ANOVA using a nearest-neighbor adjustment is computed based on the nearest 8-plot mean. If the coefficient of variation is reduced and the variance due to genotypes the same or increased, those adjusted means are used for the summary. 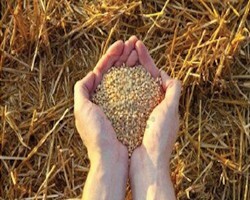 All trials are fertilized according to soil test recommendations for small grains. Winter grains generally receive a top dress of 38 kg/h (34 lbs/a) of actual N in the spring.